Have some bucks availible; looking for something unique and cool? 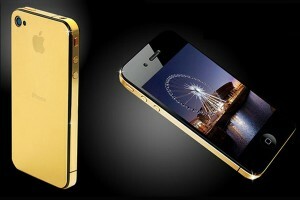 Hmmmm then take a look at the Iphone 4 Gold edition! The company Goldstriker Internatonal took the black iPhone 4 32GB smartphone and dips the buttons and the antenna surround in yellow gold, white gold, or rose gold. Before the antenna and buttons were dipped in gold, the parts were polished for more gleam. As you can imagine the device is crazy expensive. The half-gold version with the back not covered in gold is £1,595. The full gold version with the glass back coated in gold will be £2,195.